To fuel its growing economy, India is turning to Iran. A proposed 2,600-kilometer gas pipeline would carry natural gas from fields in Iran to India to satisfy the country's increasing demand for energy. The proposed 7.5-billion dollar pipeline would run through Pakistan. Iranian President Mahmoud Ahmadinejad and Pakistani President Pervez Musharraf cleared obstacles to the planned pipeline after the Iranian President's recent visit to New Delhi and Islamabad. Washington continues to oppose the pipeline because it believes the pipeline will bolster Iran. At the International Atomic Energy Agency meeting in 2005 in Vienna, India voted for Iran to be referred to the U.N. Security Council because of its nuclear program. Tehran conveyed its disappointment with New Delhi, but said it had no plans to pull out of the gas deal. Patrick Clawson is Deputy Director for Research at the Washington Institute for Near East Policy. He says the United States appreciates the support India has given on the issue of Iran's nuclear program. But he adds that Washington would be delighted if the Iran-India pipeline never got built: "The concern is that the international investment in Iran's oil and gas industries is giving confidence to the Iranian government, and that Iran is not paying much of a price for its defiance of the Security Council over the nuclear matter. "The United States says Iran would benefit from huge gas sales as a result of the pipeline. Washington fears the pipeline will reduce the West's economic leverage over Tehran - economic leverage that is necessary to persuade Iran to abandon its nuclear ambitions. However, India's interest is obvious. India is the world's sixth-largest consumer of energy, while Iran is one of world's top oil and gas producers. 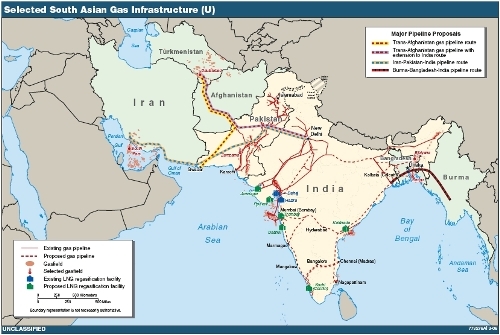 India currently produces only half the natural gas it needs and imports 70 percent of its crude oil. Vijay Rana, a London - based journalist and a former BBC broadcaster, says India's priority is fulfilling its energy needs, and the gas pipeline is crucial to India, which relies heavily on fuel imports for its fast-growing economy: "It is an energy-hungry country, economic development is very fast in the country, and they really need energy resources. So, they are keen to have this gas pipeline." Indian Foreign Secretary Shiv Shankar Menon says neither the pipeline nor the relationship between India and Iran should concern Washington or any other third country: "Everything we do with Iran is open, above board and quite clear to everybody. Frankly, from our point of view, the more engagement there is, the more Iran becomes a factor of stability in the region, the better it is for us all." "If Indian public opinion sees that Americans are pressurizing India because India wants to have good relations with Iran, then old memories of the Cold War come into play, and a big part of public opinion, particularly the left parties, say that we should not be pressurized by a superpower like America and we should be free to have whatever relations we want with any other country like Iran." Pakistan is in favor of the pipeline project because, in addition to getting natural gas from Iran, it would earn an estimated one billion dollars annually in transit fees. Iran would ship approximately 5 million tons of natural gas to India over the next 25 years and would be worth approximately $22 billion dollars. Washington-based Pakistani journalist Khalid Hasan thinks the United States will not let the pipeline deal jeopardize its good relations with India and Pakistan: "The fact is that this pipeline suits Iran, it suits Pakistan, it suits India, says Mr. Hasan. "It will also be a major contributor to the goodwill of the peace process now underway between India and Pakistan. So, I think the national interests of all three countries will override any objections the U.S. might have." However, Patrick Clawson of the Washington Institute for Near East Policy says he suspects this pipeline may not get built because Iranians have a long history of signing international agreements and not implementing them. 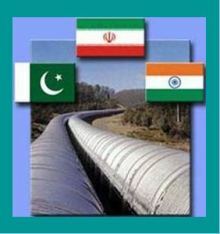 Officials from Iran, India, and Pakistan say they have agreed to complete the project by 2012, and Iran plans to begin exporting gas to India and Pakistan by 2013. Many analysts say because India understands the importance of its strategic partnership with the United States, it would certainly keep Washington informed of any deal with Iran.